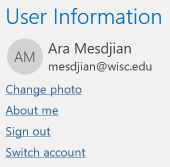 For best results and interaction with your UW-Madison Office 365 account, it is important that your Office application (Outlook, Word, etc) be authenticated with the same account that is configured within your Outlook profile. There are times when this is not the case and will cause access errors, email or calendar syncing issues, or issues syncing to other accounts that you have permissions to. We see this issue for computers that are connected to Active Directory (AD). Start Outlook. Note: if Outlook cannot be started, use another Office application (Word, Excel, etc.). On the 'User Information' screen, make sure the account that is logged in matches the default account configured within the Outlook profile. If the accounts are not the same, click the Sign out action. Then click Sign in action. Enter your email address associated with your NetID account - netid@wisc.edu or first.lastname@wisc.edu or name@domain.wisc.edu. Start Outlook and confirm the "Office Account" now matches the default account configured within your Outlook profile. On the start page, click on the account or click on Sign in located at the top left of the window. If the account does not match the default account configured within Outlook or your Office 365 account, either sign out and sign back in or click on the Sign in action. Start Word and confirm the user information now matches the default account configured within your Outlook profile or your Office 365 account.